Saudi Crown Prince Mohammed bin Salman held talks in Tunisia on Tuesday as hundreds of protesters rallied against his visit, urging justice over the murder of journalist Jamal Khashoggi and condemning the Yemen war. Saudi Arabia’s de facto leader, who flew in from Cairo, met with Tunisian President Beji Caid Essebsi before they dined together with Prime Minister Youssef Chahed. Upon receiving him, Essebsi said the Saudi royal was “not merely a guest of Tunisia, he is at home here”, stressing the importance of their countries’ ties. 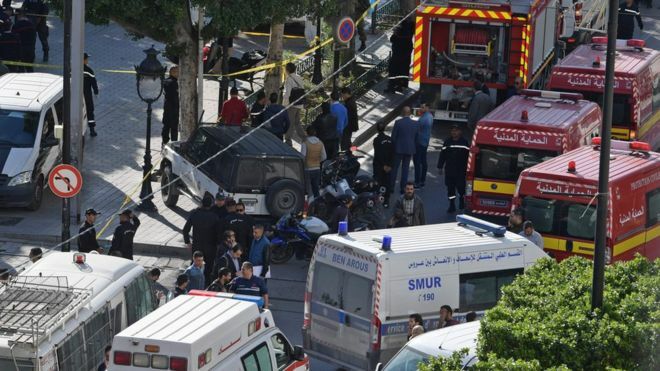 The Tunisian presidency said the two men had discussed “ways to strengthen cooperation”, including boosting investment as well as security and military links. Prince Mohammed’s stay in Tunisia is part of a regional tour, which comes as Khashoggi’s murder leads to increased scrutiny of Saudi Arabia’s role in Yemen’s devastating war. “Go away assassin!” protesters shouted in the second rally in Tunis in as many days against the Saudi crown prince’s visit. Demonstrators held placards with slogans including “The people want Bin Salman to be judged”, “No to the killer of Yemeni children”, and “You’re not welcome”. “It’s inhuman to see an Arab leader killing his brothers in Yemen, and the murder of a journalist is the icing on the cake,” said Basma Rezgui, a teacher brandishing a red-stained saw. Saudi Arabia has faced intense global criticism over the killing of insider-turned-critic Khashoggi in its Istanbul consulate on October 2. He was reportedly dismembered in what Saudi Arabia said was a “rogue” operation, but CIA analysis leaked to the US media pointed the finger at Prince Mohammed. The crown prince’s visit is the first by a Saudi royal to Tunisia since the 2011 revolution deposed longtime dictator Zine El Abidine Ben Ali, who fled to Saudi Arabia. Political analyst Youssef Cherif said the protests against Prince Mohammed were a sign that post-revolution Tunisia “is one of the rare Arab countries where one can take such a stand”. The Saudi crown prince has also held talks in the United Arab Emirates, Bahrain and Egypt on his first foreign tour since the Khashoggi affair erupted. In Cairo, Egyptian President Abdel Fattah al-Sisi praised the “unshakable strategic alliance between Egypt and Saudi Arabia” during the visit, the state daily Al-Ahram reported Tuesday. “The stability and security of Saudi Arabia is an integral part of Egypt’s security,” Sisi said.